Did you ever have an old metal lunchbox with Roy Rogers and his horse Trigger painted on the outside? If you were born a generation later, you might have carried a plastic Barbie or GI Joe lunchbox with matching Thermos bottle to school. 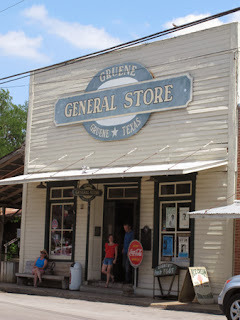 Memories like these are easy to come by in Gruene, Texas, especially when browsing around the original 1870-era mercantile store--now a nostalgic trip back in time for many visitors. Sure, Gruene is a wonderful place to reminisce about the “good old days,” but did you know that this mid-1800s German settlement on the Guadalupe River in central Texas almost became a ghost town before being rescued from oblivion? 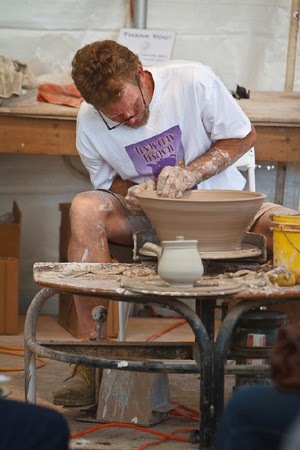 Today, Gruene has developed into a major year- round entertainment center with an emphasis on families sharing good times. 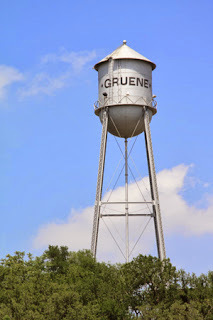 Named for Ernest and Antoinette Gruene, who were among the German immigrants arriving in the 1840s, Gruene is just 45 minutes from Austin and 30 minutes by car from San Antonio. In 1872, the Gruene family set up a tenant farming system for raising cotton, and one of the sons opened the first business in the new town, a small mercantile shop and cotton gin. 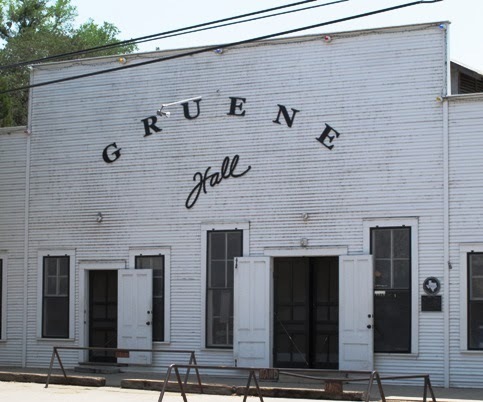 Henrich D. Gruene also opened Gruene Hall, which became a gathering place for the tenants. About that time, the town became known as Gruene. many free and open to the public. When H.D. Gruene died in 1920, the small town began to decline. The original grist mill was destroyed by a fire and replaced with an electric cotton gin. A boll weevil infestation destroyed cotton crops in 1925 and with it the livelihood of most of Gruene’s residents. Then came the stock market crash, which devastated the remaining residents of Gruene. The final blow occurred when the family foreman hanged himself from the (now iconic) water tower. often held in the garden. Fast forward to 1975, when Pat Molak discovered Gruene and decided to purchase the abandoned dance hall. After a few necessary repairs were made, the 6,000 square foot open-air dance hall continued its tradition as Texas’s oldest continually operating dance hall. clue what those things are. In 1977, Molak and Mary Jane Nalley joined forces to purchase the original cotton gin, a three-story brick boiler room, and they created the Gristmill River Restaurantand Bar in the old building. The pair expanded their acquisitions to include the old Mercantile building, one of the Gruene family’s original homes, portions of the Gruene lumberyard, and the Greuen brothers’ garage. These building have been transformed into tourist-pleasing businesses including Gruene Antique Company, Lone Star Texas Electric, Buck Pottery, Gruene General Store, Cotton Eyed Joes, Gruene Outfitters, and The Grapevine, a wine tasting venue. 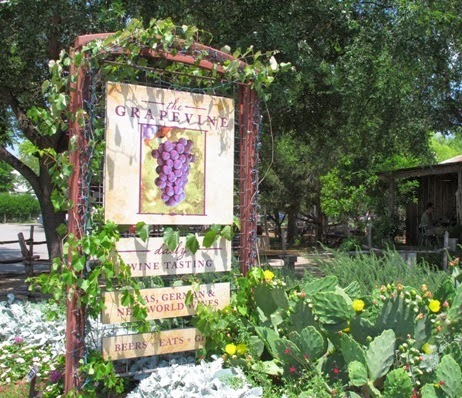 The official Historic District of Gruene, which is actually part of the city of NewBraunfels, covers a little over 15 acres. It was placed on the NationalRegister of Historic Places in 1975, and since then most of the building have been awarded a Texas Medallion from the Texas Historical Commission. A wide variety of business line the walkable streets, and this quaint area now draws more than a million visitors annually. A plethora of special events fill Gruene’s calendar, including Gruene Music and Wine Festival, the Americana Music Jam, Tour de Gruene bicycle race, Gospel Brunch with a Texas Twist (held most Sundays in Gruene Hall), Texas Clay Fest (attracting artisans from all over the state), various 5K and 10K walks and runs, Old Gruene Market Days (held the third weekend each month), and more. 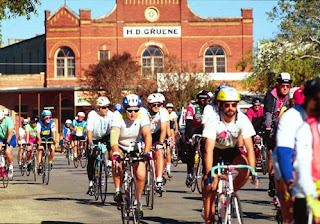 Tour de Gruene is a favorite event. With so much happening in Gruene, it’s no wonder this historic district has become a major tourist attraction in Texas. Katie Molak, Marketing Coordinator, assisted with historical information. Photos by Beverly Burmeier (except potter and bike race, which were provided by Katie Molak).